When Louis-Jacques-Mandé Daguerre introduced photography to the public in 1839 it generated much interest and excitement. 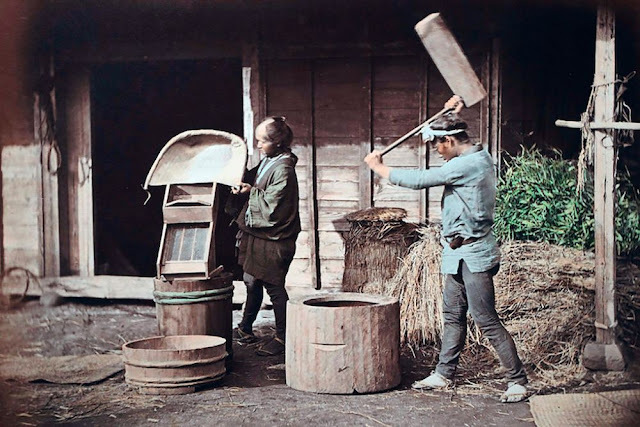 But for many, including Daguerre, the lack of color in an otherwise “highly realistic medium” proved to be a disappointment. Early research and efforts to produce color photographs aroused public demand and eventually led to the popularity of hand-colored photographs, which proved to be the simplest and most effective way for photographers to satisfy public desire. 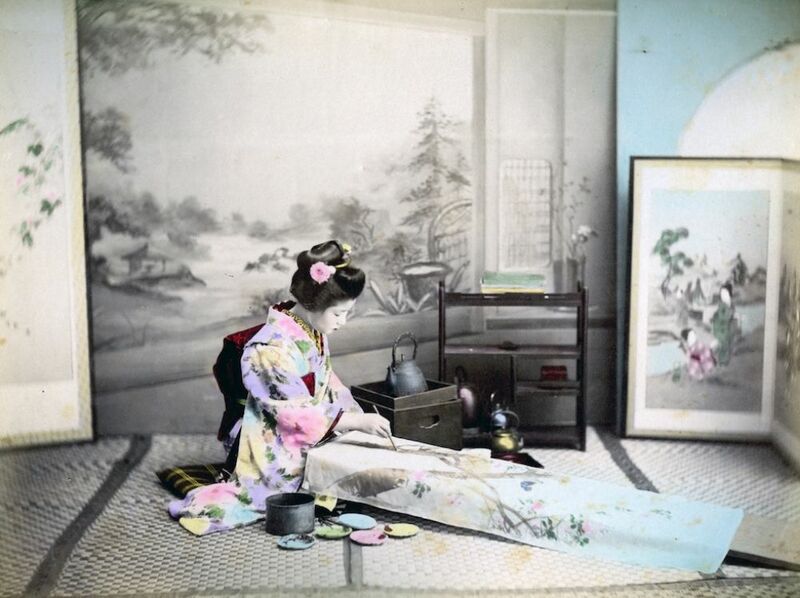 Introduced in Europe in the 1840s, the practice of hand coloring photographs became more refined and widespread in Japan. 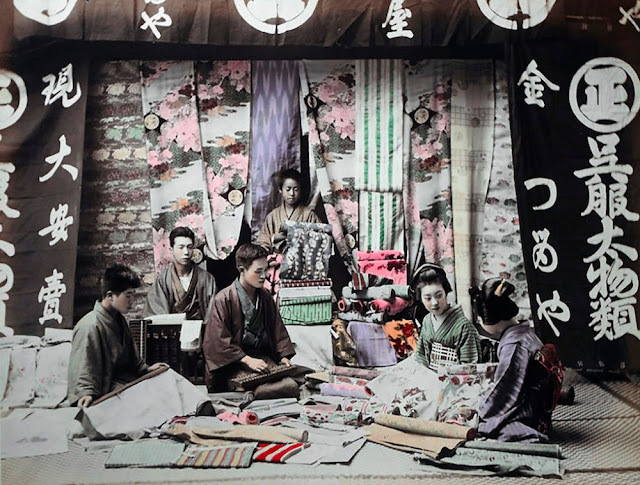 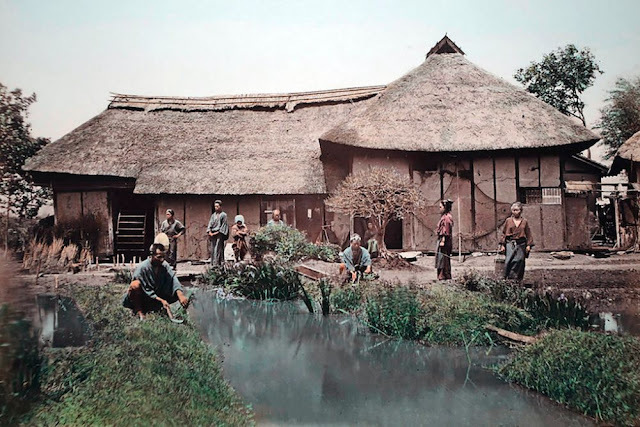 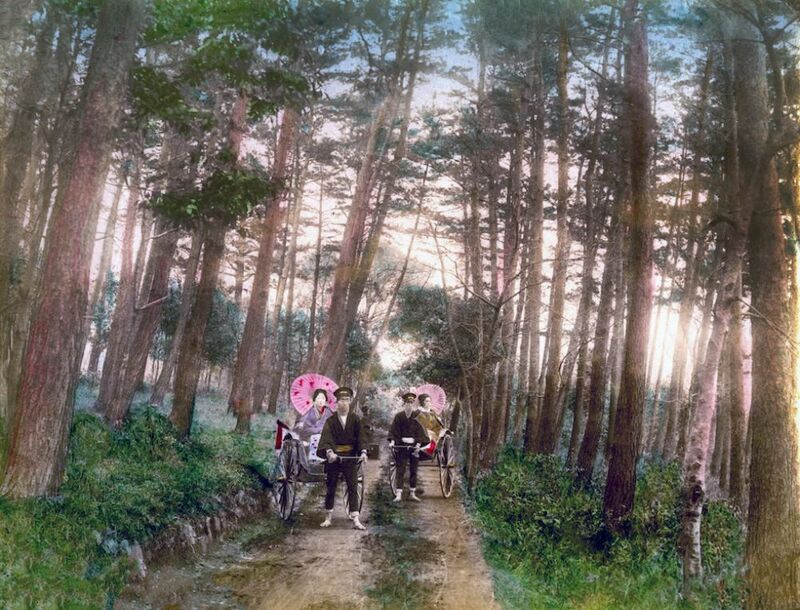 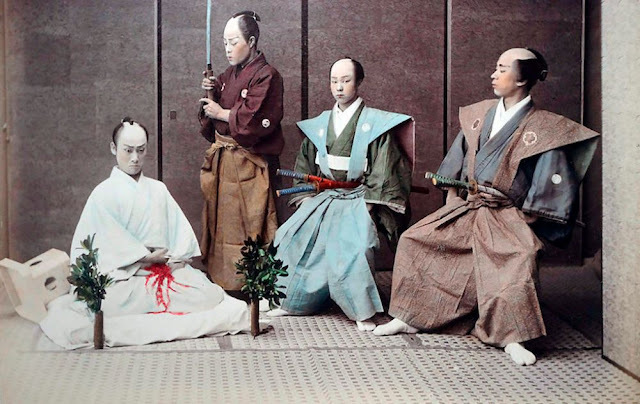 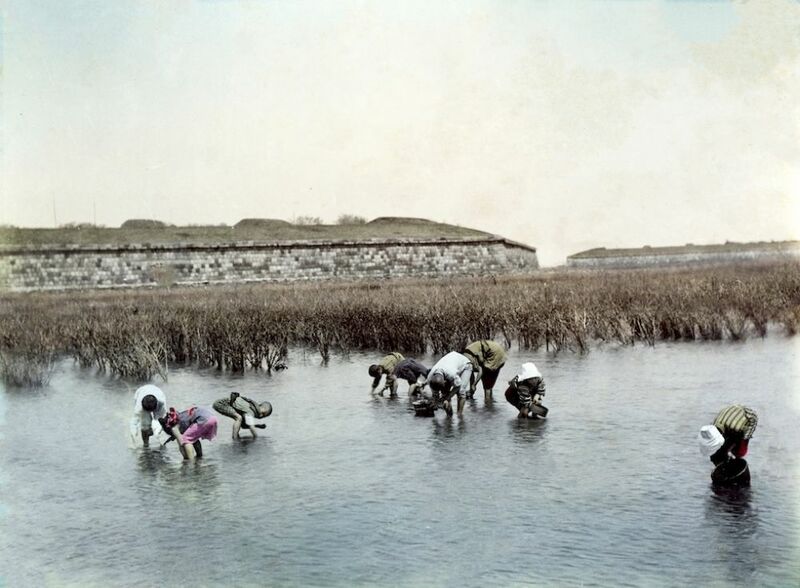 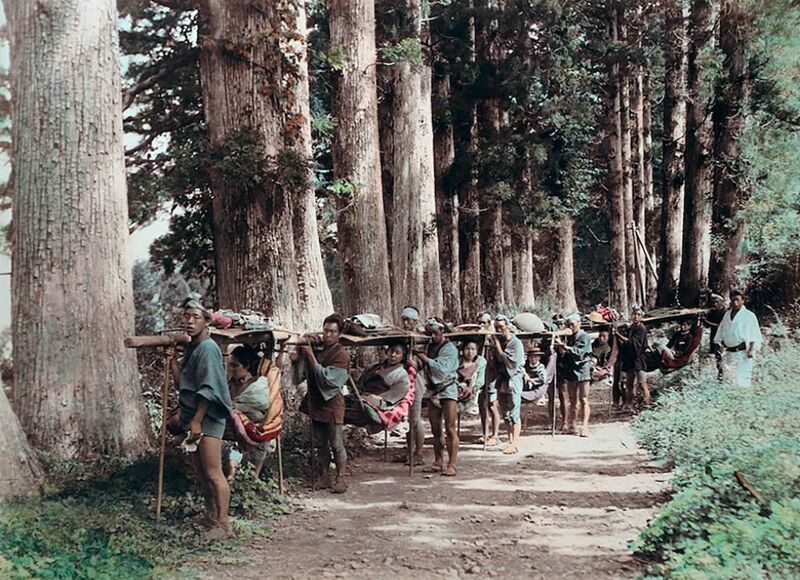 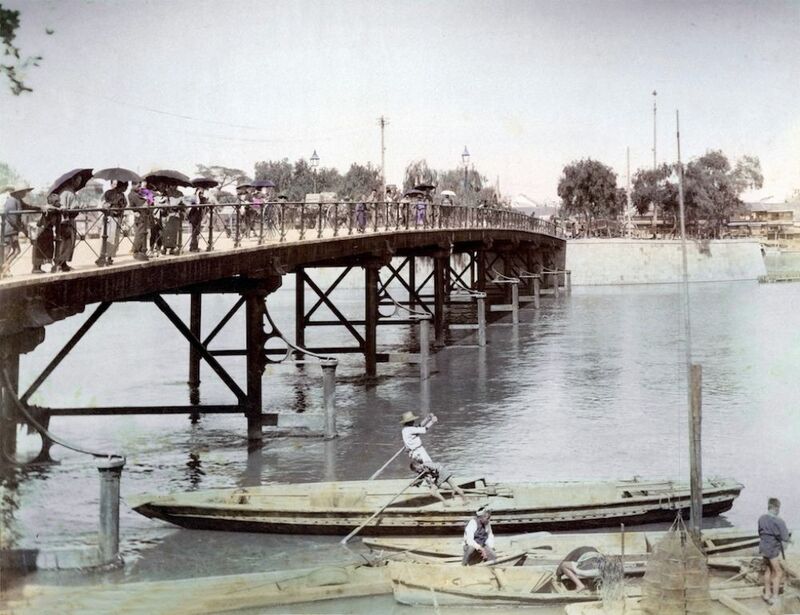 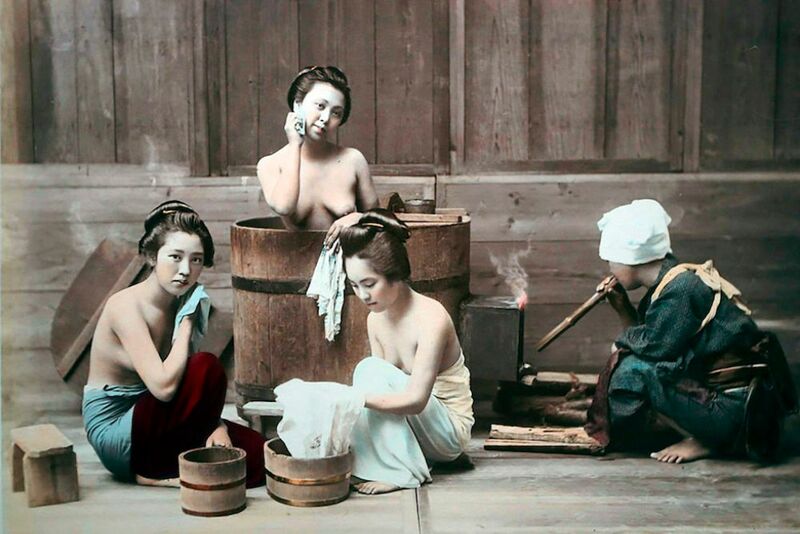 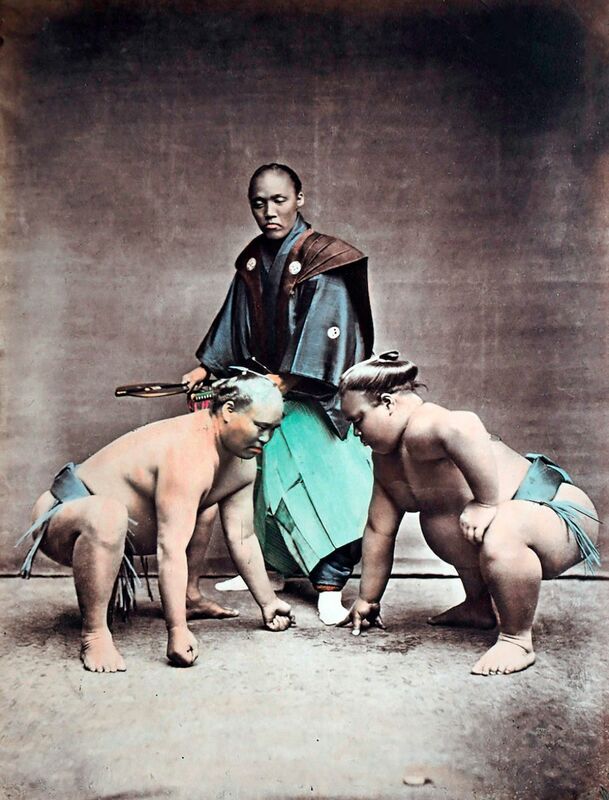 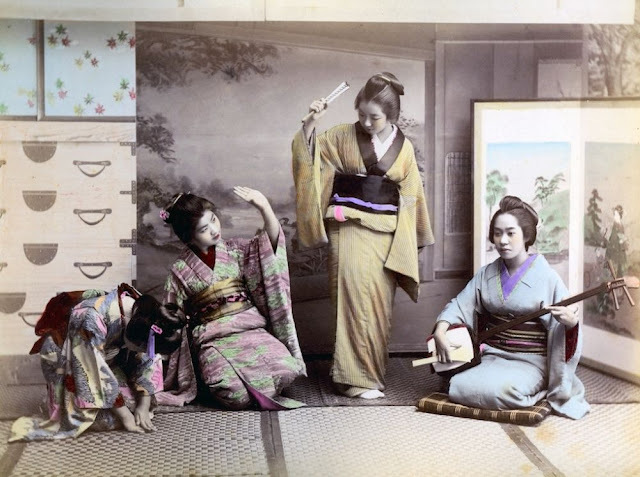 By the 1880s, it had become a common practice and a defining characteristic of Japanese tourist photography. 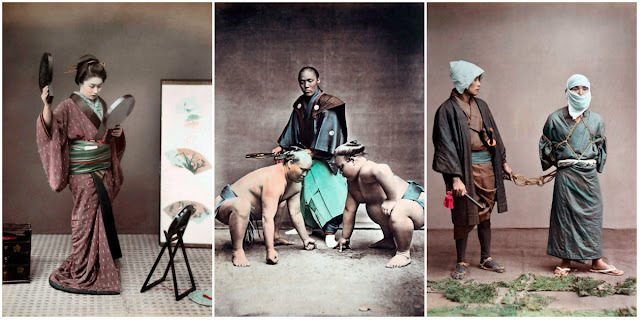 Various sources attribute British artist Charles Wirgman and photographer Felice Beato with introducing this technique, but in Photography in Japan, 1853-1912, Terry Bennett cites early newspaper advertisements and a review in the Japan Herald in suggesting that British photographer William Saunders “may have been the first” to offer hand-colored photographs in 1862. 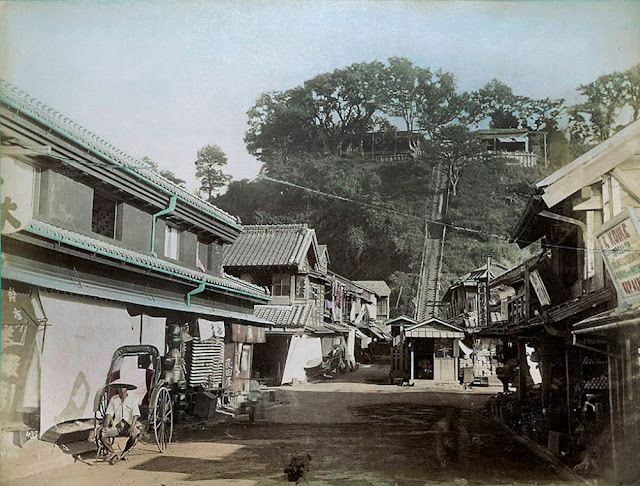 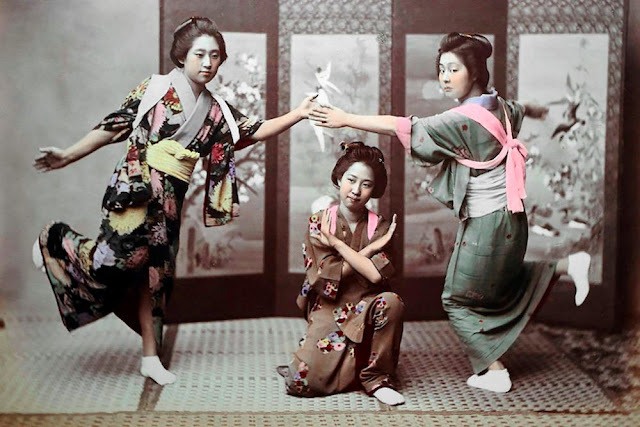 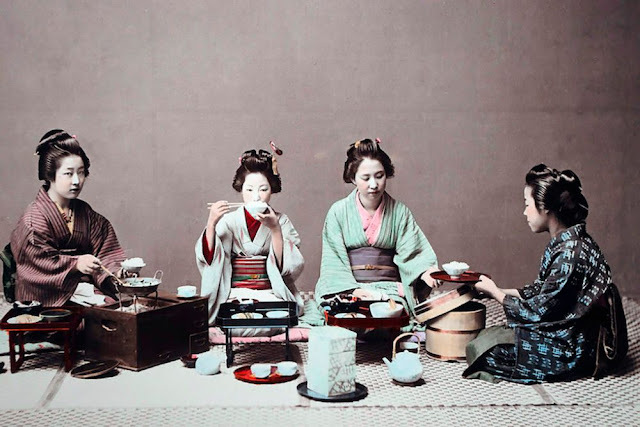 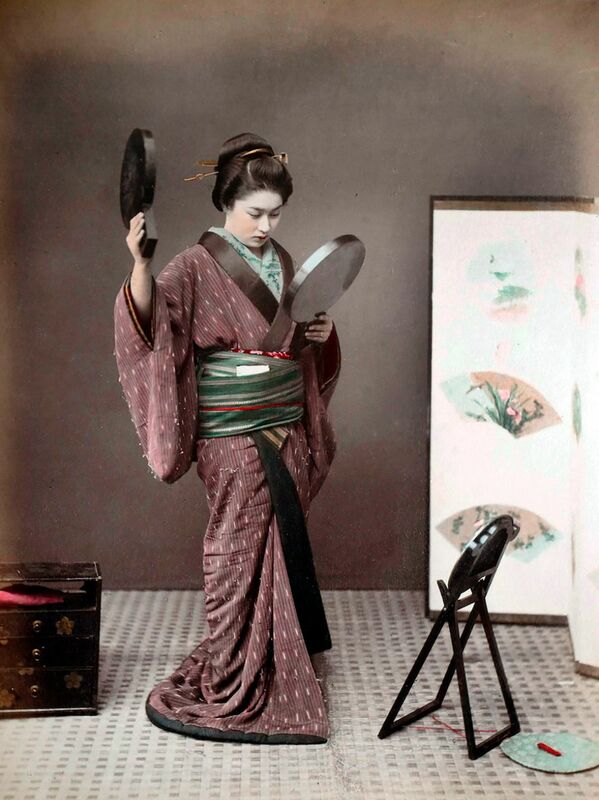 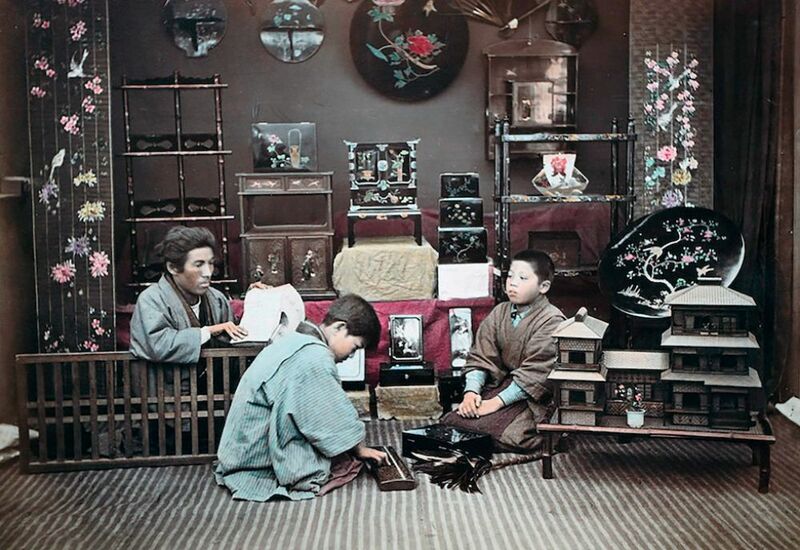 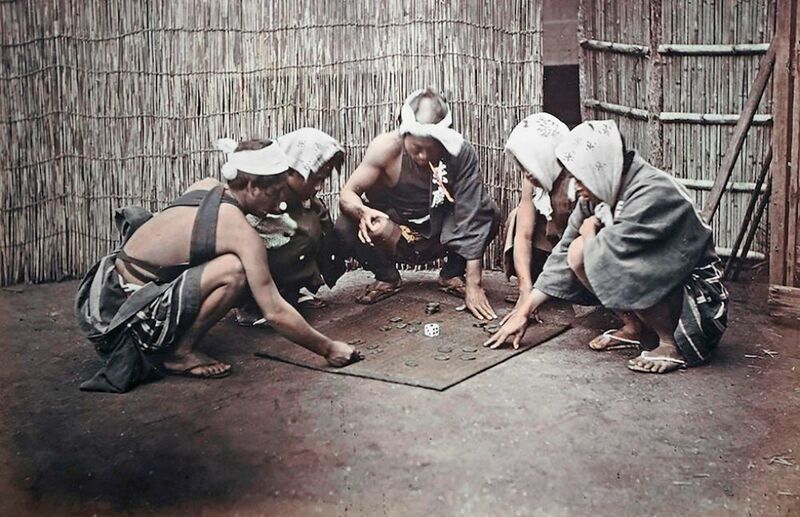 Still, it is generally acknowledged that Beato popularized the style of hand coloring that many other photographers embraced during the Meiji period (1868-1912). 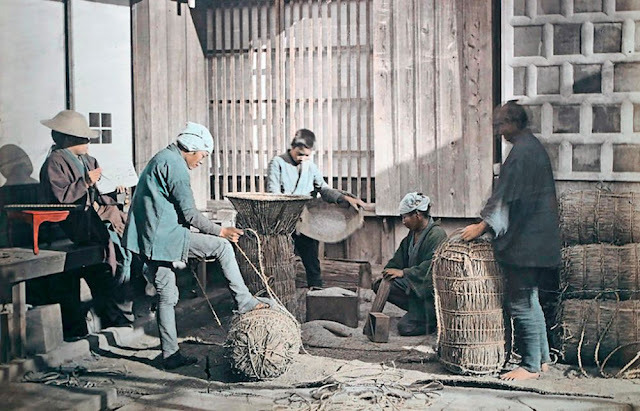 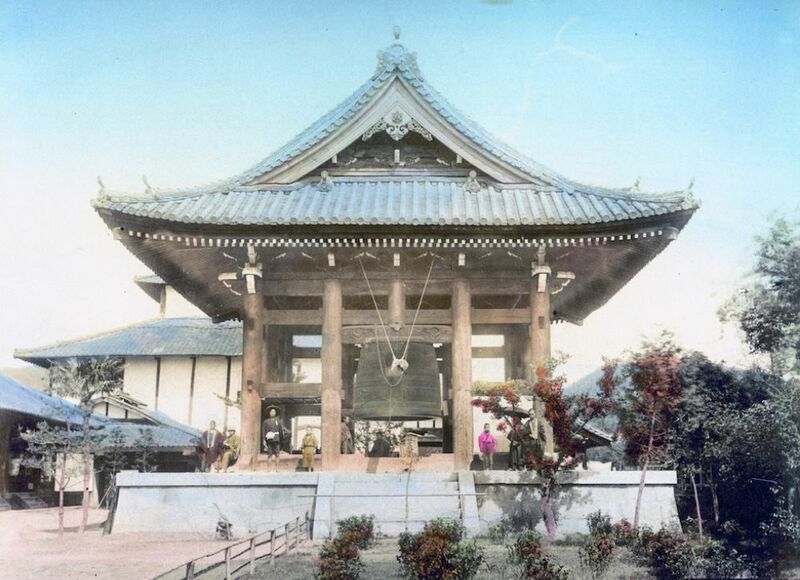 Following the Meiji Restoration, photographs largely replaced woodblock prints in popularity, although famous ukiyo-e prints were frequently imitated in Japanese tourist photography. With a dramatic decline in production, many Japanese artists who worked in woodblock print shops became unemployed. But the growing market for photography offered them a new opportunity to apply their talents. The technical skill of some artists reflected a method of application that raised the practice of hand coloring photographs to a respected art of striking beauty. 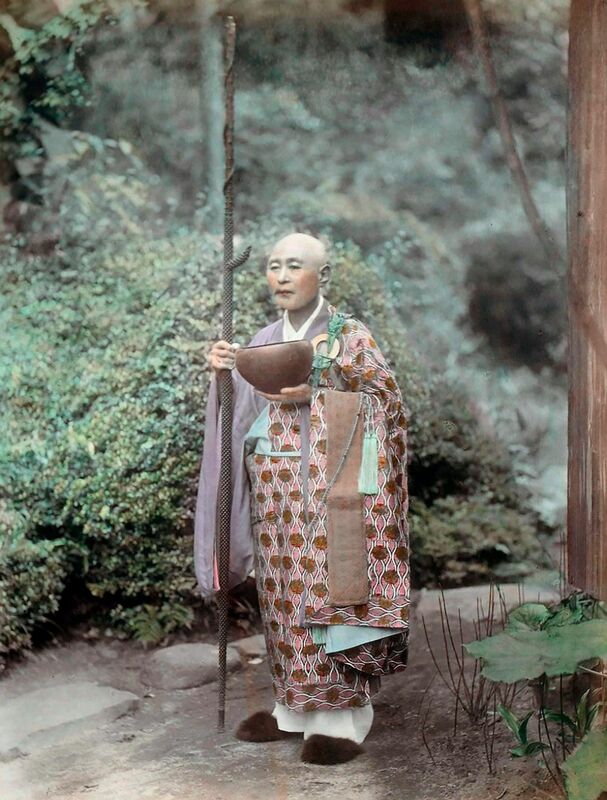 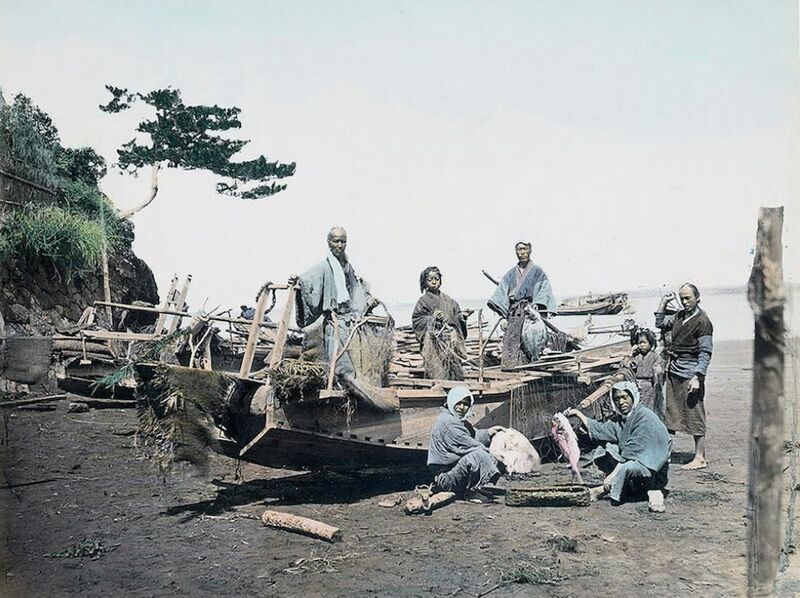 A photograph taken in 1867 or 1868 by Felice Beato, entitled “Our Painter” in his published album Photographic Views of Japan, portrays a Japanese man holding a palette and brush. 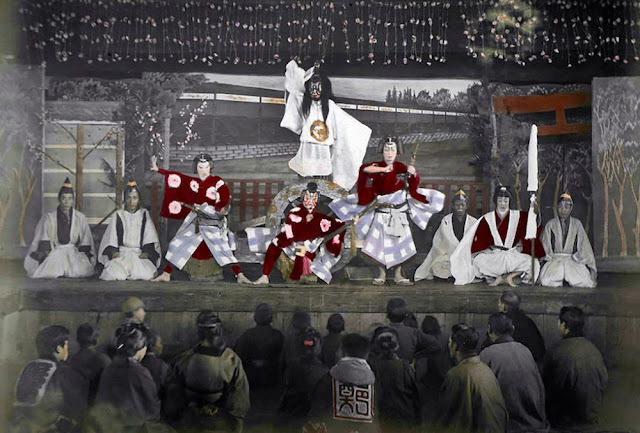 The portrait suggests Beato recognized and appreciated the skill of this artist in contributing to the distinctive quality of his work. 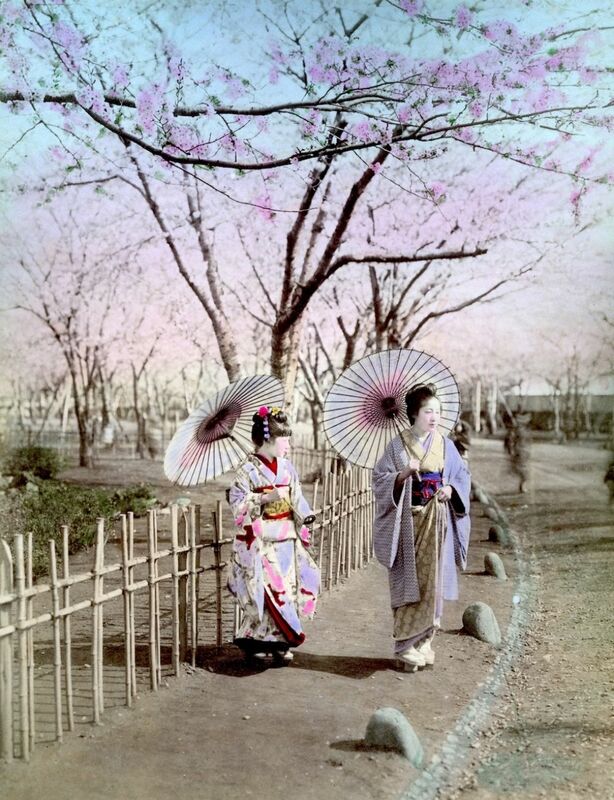 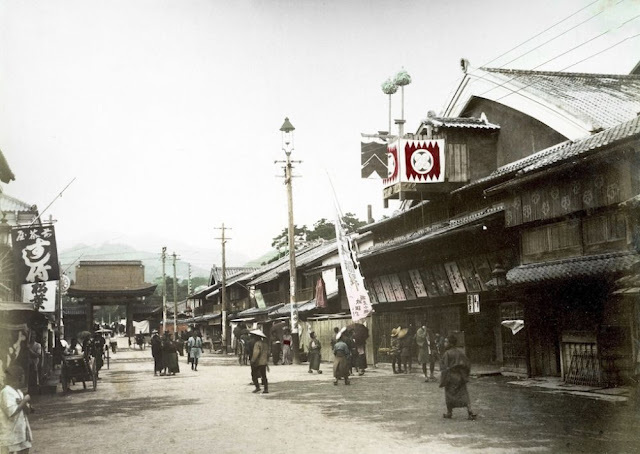 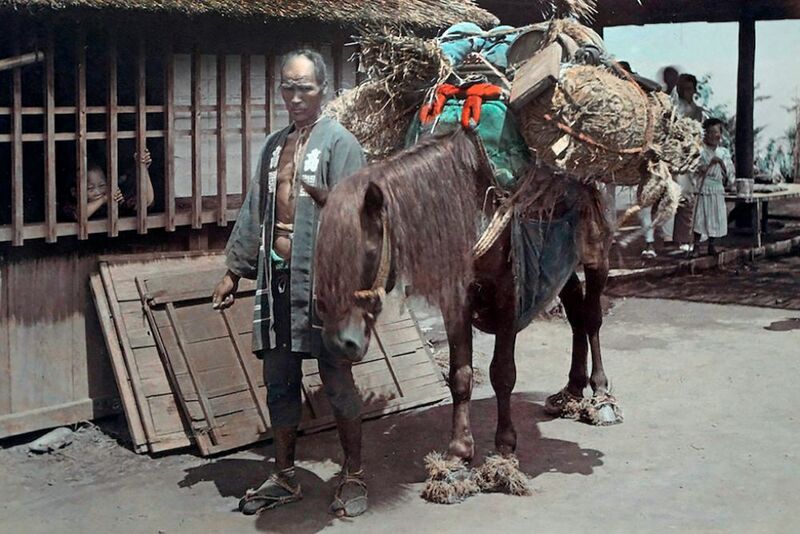 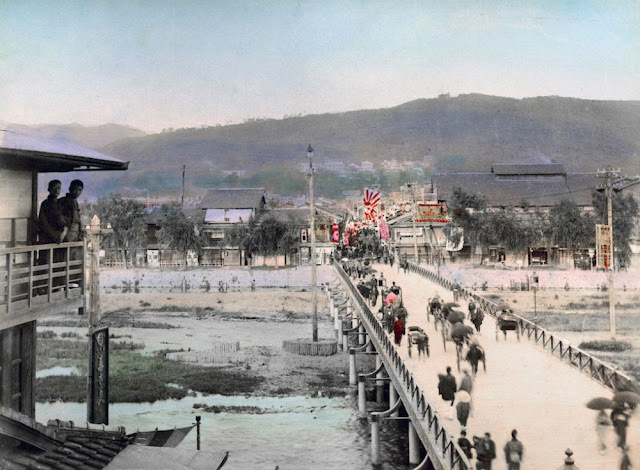 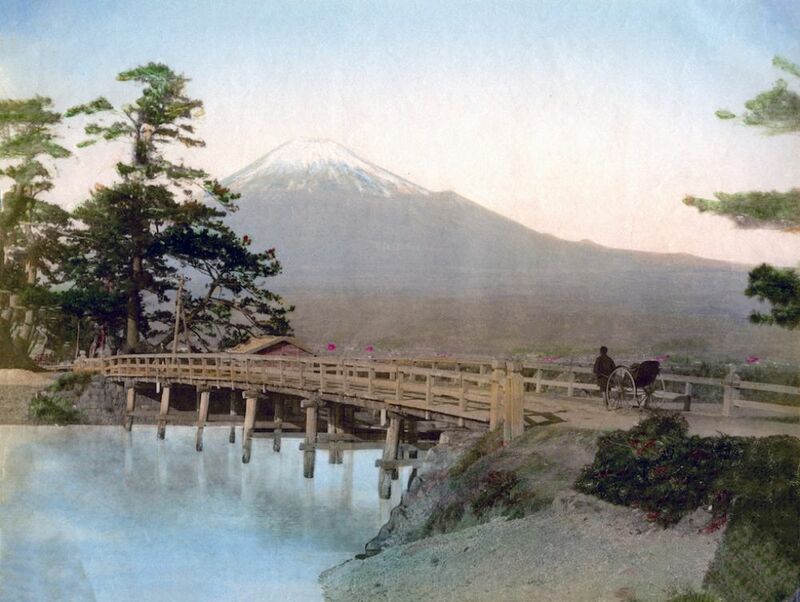 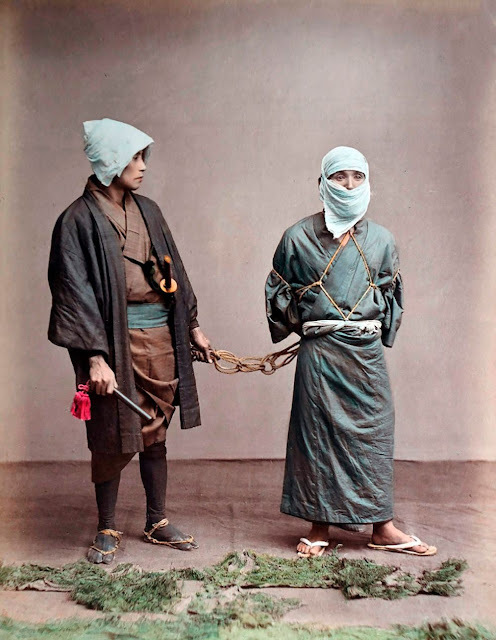 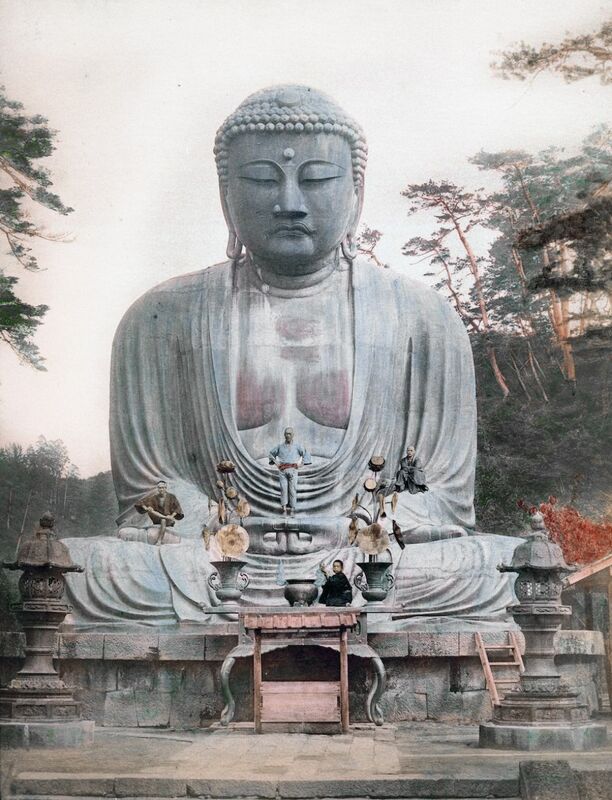 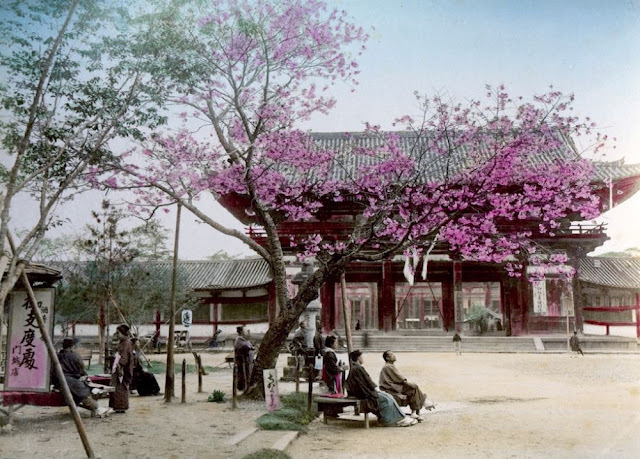 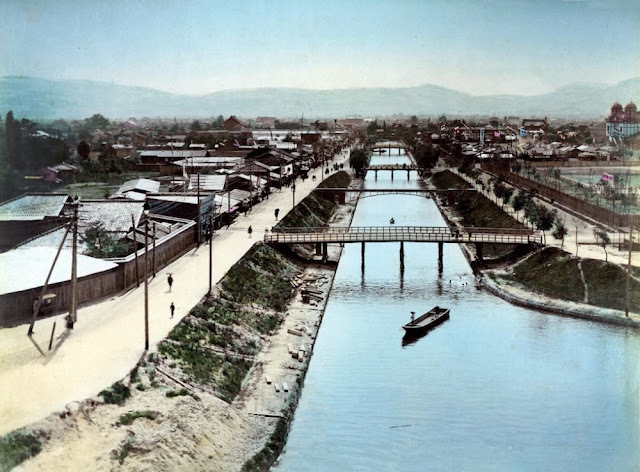 Most of the hand-colored photographs in Japan are monochrome albumen prints made from wet collodion or dry plate glass negatives. Although it is possible some subtle tones of brown and purple could have been brought out by the photographer in the development process, color was added by artists, or colorists, using water-soluble pigments, which were more transparent than the oil paints commonly used in the West. 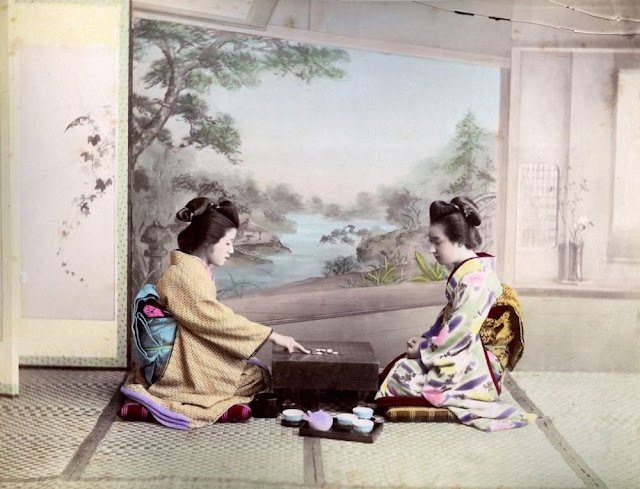 Working on a low wooden table laid out with brushes, inkstones, and porcelain bowls, artists applied colors, prepared with a small amount of buckskin glue, in a delicate and precise manner. 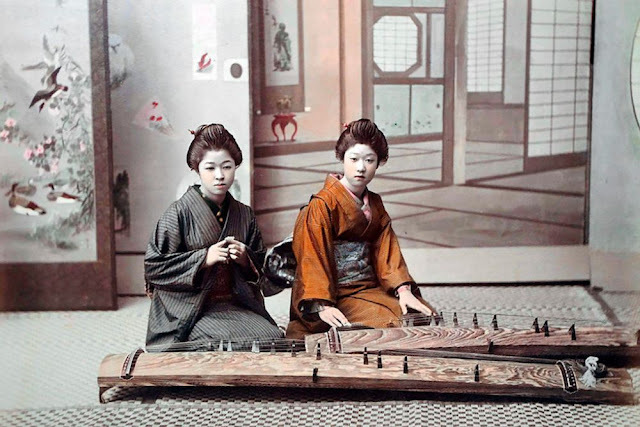 In the 1880s and 1890s they began using more vivid colors made from aniline dyes. 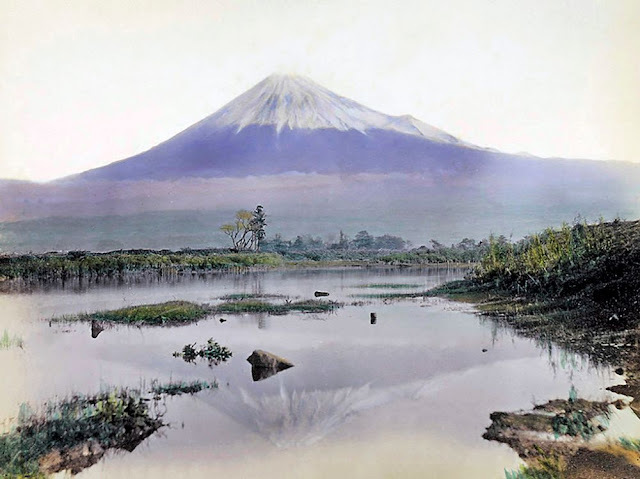 Today, these artificial colors can appear harsh or “loud” in contrast to “the softness of natural pigments and albumen.” When more than one print from a negative was required, an artist would create a template to ensure consistency. 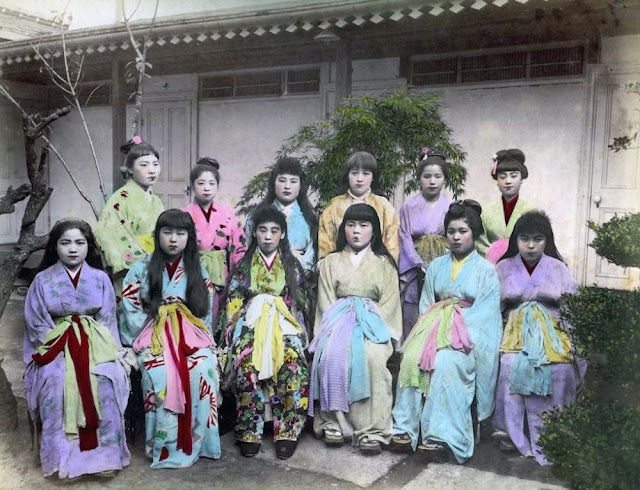 But copies of the same photograph by different colorists from different studios show variations in color and technique that suggest they were allowed some artistic freedom.